As a consequence of the tariff increase on natural monopolies’services and on raw materials SEVERSTAL moved up prices on its products from 1 July declaring that the growth will be in the range of 6-15% dependent on assortment. 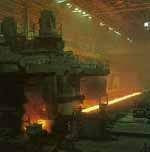 Anatoly Kruchinin, SEVERSTAL’ General Director, complained unfavorable conjuncture on markets and unsimple situation in metal-consuming sectors overall had not allowed for a long-time to compensate the fact of tariff increase. In particular he marked that in comparision with the last year petrolium products have already deared twofold, metal waste on 10% and finally natural monopolies services’ increase means increase in payments toGazprom, RAO EAS and MPS this year already on 60 mln $$. In explaination he concluded that looking at the price level the company mainly returns to its level of January 2001.
Business news archive for 02 July' 2002.